Microwaves101 | How many sections do you need in a Wilkinson? Suppose you wanted to power-combine two amplifiers that work from 2-18 GHz. 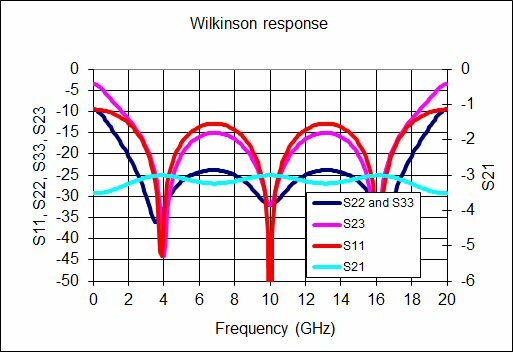 Here's the rule of thumb: The number of sections you will need is the ratio of the lowest frequency to the mid-band frequency. The sections all have length equal to quarter-wave at mid-band. 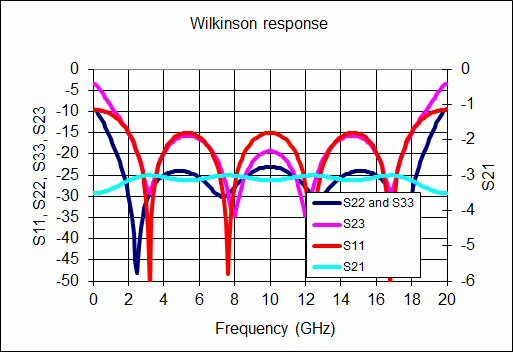 The overall length will be 1/4 wave at the lowest frequency. Thus, a 2-18 GHz combiner needs 5 sections. What if your customer wants to add some bandwidth at the lower end, say, 1-18 GHz combiner? That would double the length of the combiner to 10 sections, and double its loss! If you want to get to 500 MHz, you will need 20 sections. Maybe someone has done this, but we've never seen it! Our Excel spreadsheet for Wilkinson designs stops at eight sections. 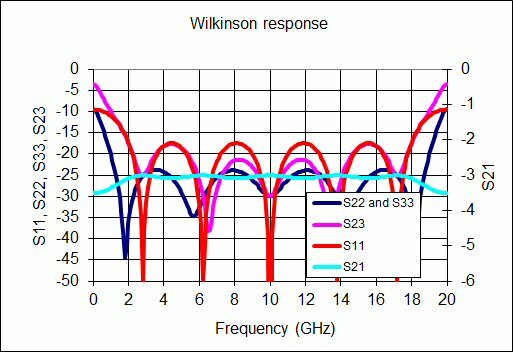 Here's the evidence... We used our Excel spreadsheet (look here) to examine three cases: three, four and five sections, for a 2-18 GHz combiner. Chances are your requirement is going to ask you to beat 1.5:1 VSWR (14 dB return loss). Here is the response of three sections, you won't get better than 13 dB return loss across the band. Here is four sections... you can tell how many sections by the number of dips in the reflection coefficients, dig? Now the S11 reflection coefficient is improved to 15 dB. That is too close for comfort, if the band shifts left or right when you manufacture it, you are in trouble. And here is five sections. Now we have ~17.5 dB return loss on S11. Now you have some margin. Note that the split ports' reflection coefficients (S22 and S33) are naturally better than the the combined port (S11), so long as you have ideal resistors. What happens when you discover your resistors are not ideal? We'll save that lesson for another day.